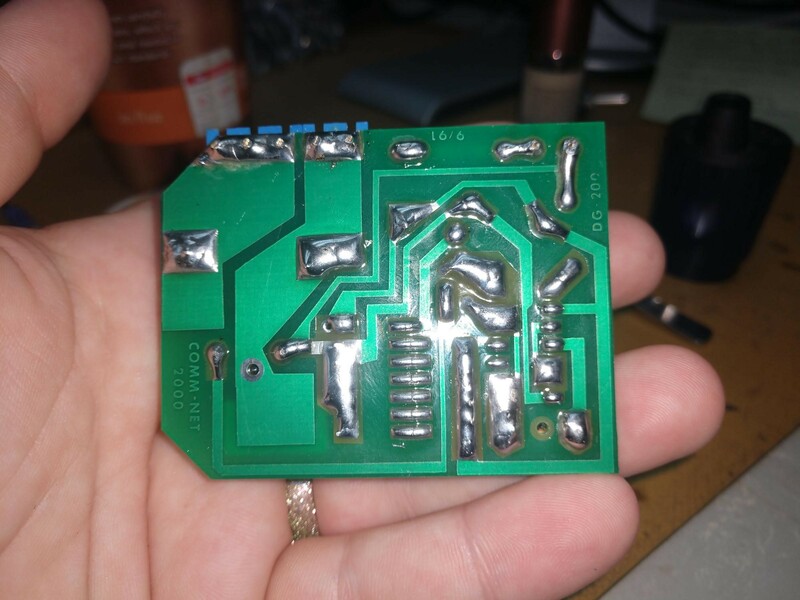 This is part of an automotive timer (NOT a 555!) that we have at work. Because I'm extremely bored I'm challenging myself to understand how this one operates. I've spent about 1.5 weeks with tutorials, brushing up on my transistors, flip flops, electrostatics and such. My area is RF not power and this is extremely difficult for me. I tried as best as I could and it's keeping me up at night. I know that a BJT needs to have a base voltage to turn on but this one's base is connected to the inputs of a NAND gate as featured in the pin out of the IC. (a CD 4011BC) There are a number of other connections but I haven't drawn them here to keep things simple. The emitter is connected directly to a relay coil and the approx measured voltages are listed on the paper. The collector gets +12V in and the base is connected to pins 13 and 12 which are inputs into a NAND gate on the IC. I do not understand how this device is able to run. I don't have all the pin-outs drawn on this picture but I do have it elsewhere. I wanted to focus on how the bjt can even turn on if there's no (what I assume to be at least) base voltage or current. It does run though, and times correctly. From what I have learned it's in the active region of operation. Please help! Editing to add another picture. Note that the drawing differs slightly from the picture due to connections running under the IC. The dot on the IC is at the top left, so the 1-7 pins are on the left side. I drew it the way I did to make it easier to visualize as, of course, traces are all over. I can redraw this if necessary. Also, the stuff on the caps is melted rubber band goo, not exploding cap goo. 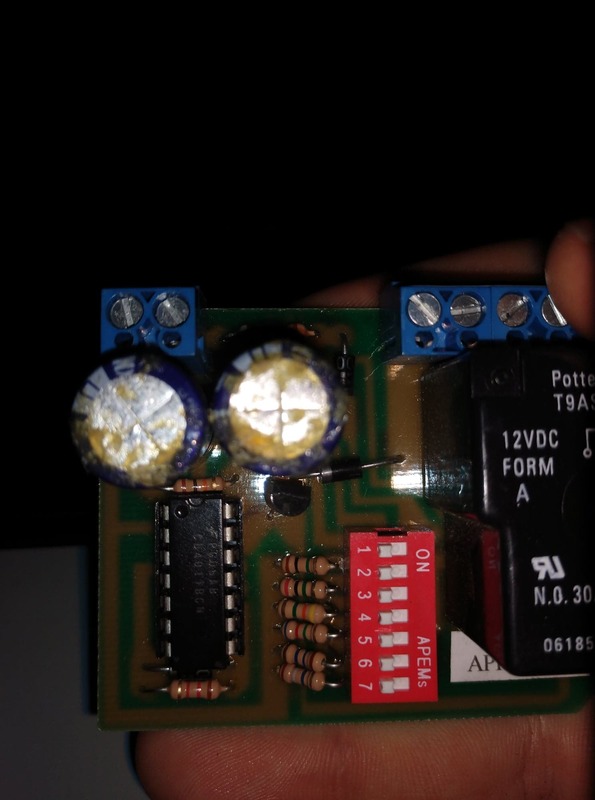 Pin 1 is VCC, connected to 12V in through a resistor that is also connected to the collector on the BJT. Input to NAND 1. Pin 2 is connected to the RC network, (which is a little strange to me and my next section to understand better) and is an input to NAND 1. Pin 3 is the output 0f NAND 1 and connects to pins 5&6, the inputs of NAND 2. Pin 4 is the output of NAND 2, connected to a resistor/diode in parallel that go to pins 8 and 9. 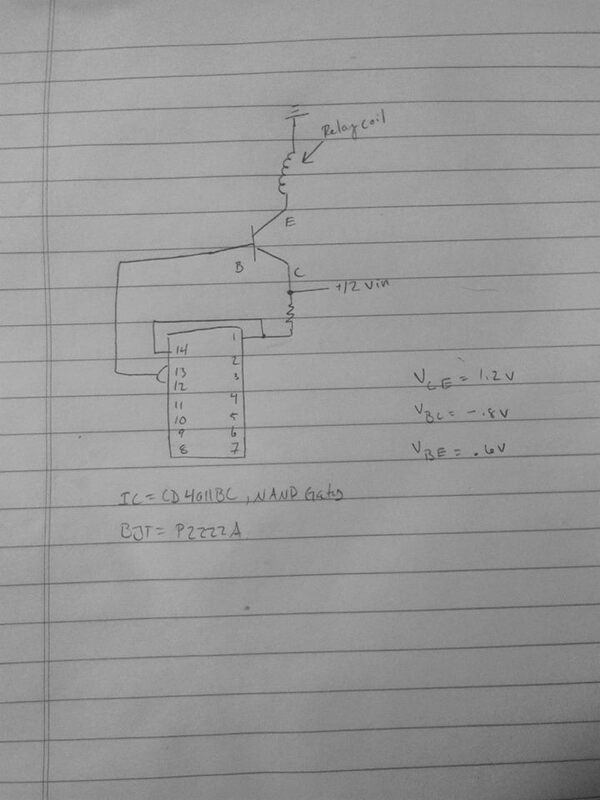 Pin 7 is ground, but in this circuit is connected to a capacitor in the RC network. Pins 8&9 are inputs to NAND 3, connected to pin 4 through a resistor. I think the diode is extra protection from back EMF from switching. 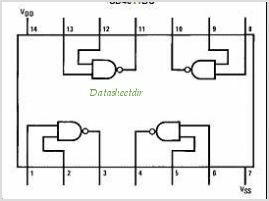 Pins 10 and 11 are outputs of NAND 3 and 4 but aren't used. Pins 12 and 13 are inputs to NAND 4, also connected to the base of the BJT AND inputs to pins 8&9. So: constant voltage to pin 1 of NAND 1 and RC on.off to pin 2 of NAND 1. Output feeds into NAND 2 which reverses the output (pin 4) and sends that to the BJT to turn it on/off. 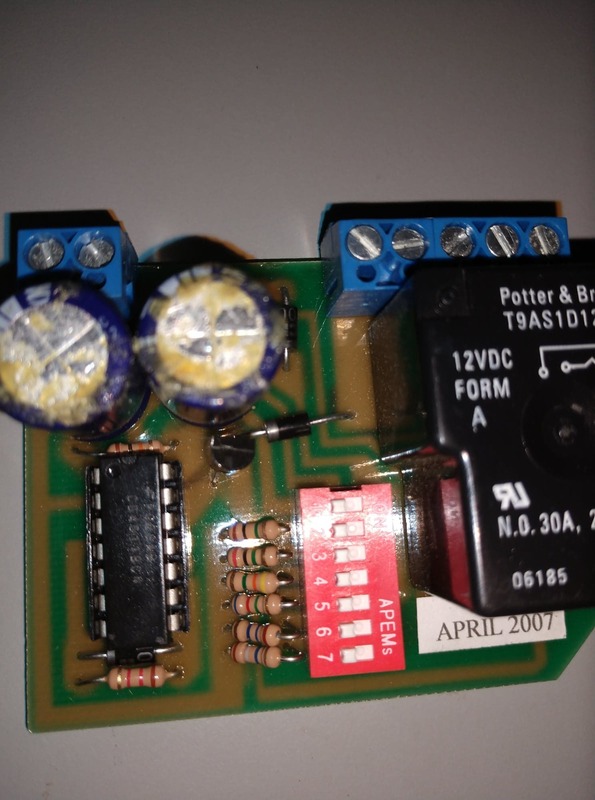 And again, pin 4 is connected to the base of the BJT, thus turning it on and allowing current to flow from collector (that is connected to +12) to emitter (relay coil). Oh, my god I'm so relieved. This was causing me major anxiety and I had to put it down for a while to focus on other stuff at work. Finally came back to it about an hour ago and while I had the correct connections, I must not have been thinking about it correctly. Phew! Not the answer you're looking for? Browse other questions tagged circuit-analysis relay bjt timer reverse-engineering or ask your own question. 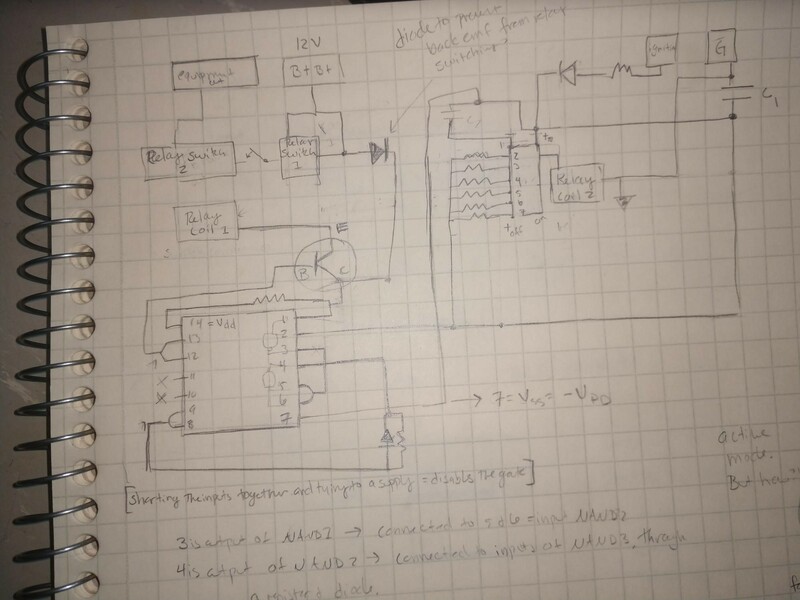 Why does this BJT logic circuit only function intermittently?